- When was the last time you did something special for yourself? Let this simple turquoise ring bring a bit of sunshine into your life. 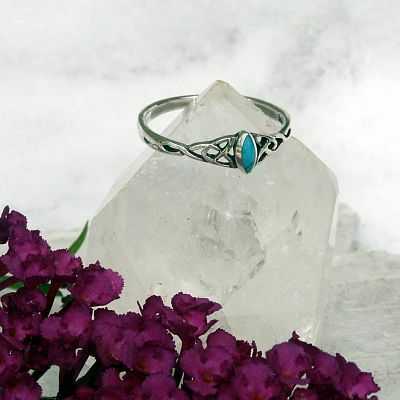 Its charming sky blue stone will lift your spirits every time you wear it. The marquis-shaped synthetic turquoise gemstone is nestled between a pair of Celtic knots. This ring is only 1/4" across at its widest point. Made of sterling silver. Choose Size... Size 4 Size 5 Size 6 Size 7 Size 8 Please choose the Size. For that price, is it really sterling silver? Absolutely! 100% real sterling silver. Not silver plated. Just a simple, honest sterling silver ring. There's nothing quite like the luster and shine of real sterling silver jewelry. Look for the ".925" stamp on the inside of the ring to be sure. That's beautiful, but is it available in something other than turquoise? It's one of our favorite designs too. That's why we also carry it in black onyx. Isn't Turquoise the birthstone for December? It sure is. 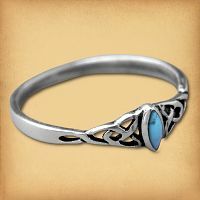 Turquoise enjoys a tremendous popularity with just about everyone, but people born in December may feel a special affinity for it. 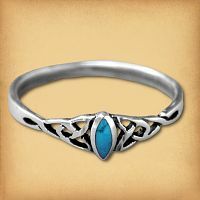 Do you have any other questions about our Silver Dainty Celtic Turquoise Ring?